The Republic of South Africa is a country located at the southernmost tip of Africa. It became a stopover point on the spice route between the Europe and the Far East. In 1652, the first formal city of Cape Town was established by the Dutch. The discovery of diamonds in 1867 and gold in 1886 spurred the interest of other European powers and soon the natural wealth of the area and the resulting immigration intensified the subjugation of the native inhabitants. Flags were first brought to South Africa by the European explorers trying to find a sea route from Europe to India and the Far East. The first to reach what is now South Africa was the Portuguese explorer Diogo C鉶. He reached the mouth of the Orange River. Later, the Portuguese explorer and navigator Bartolomeu Dias de Novaes rounded the Cape in 1488 and landed at what is now Mossel Bay. Ten years later Vasco da Gama finally reached India. These explorers belonged to a military order known as the Military Order of Christ. Its badge was a red cross on a white background (which is still used as the badge of the Portuguese air force today). In addition to the flag of the Order, the Portuguese sailors flew the royal flag of Portugal. The designs of both these banners were also painted on the sails of their ships as was the common practice amongst sailors at that time. About a century after Vasco da Gama found the sea route from Europe to India round the Cape of Good Hope, other countries became interested in trading with the east. The English East India Company was founded in 1600 for this purpose and used a flag of red and white stripes with the Cross of St George in the canton. The Scottish East India Company was founded soon after the English company and some of its ships also sailed past the Cape. After the merger of England and Scotland in 1707, the British East India Company was formed and adopted a new flag based on that of the English East India Company. Since the British East India Company didn't provide any clear instructions to their captains about the company flag design, other than using horizontal red and white stripes, we have British East India Company flags with nine, ten, eleven or even thirteen stripes and with cantons of varying sizes. In 1647 the Dutch East Indiaman Nieuwe Haerlem, was blown ashore in Table Bay and became ship wrecked. Some of the crew survived and a year later were rescued by a returning trading fleet and returned to the Netherlands. The leader of the survivors wrote to the Directors of the Dutch East India Company and pleaded for the establishment of a refreshment station and fort at the Cape. As a result, three trading ships under the command of Jan van Riebeeck anchored in Table Bay on 05 April 1652. On the following morning van Riebeeck stepped ashore and proclaimed the territory surround the Bay to be henceforth the property of the Company, which led to the establishment of a permanent European settlement at the Cape. Although van Riebeeck made no mention of hoisting a flag, the Dutch and company flags were flown on the ships of the Dutch East India Company. The Dutch flag at that time was three horizontal stripes of orange, white and blue or Princevlag. Later the top stripe became red, and these are still the colours of the Dutch flag today. The company's flag was the Dutch tricolour with the company monogram in black in the centre of the white stripe. The monogram was the letters VOC intertwined which stood for the Vereentige Oostindische Compangnie (United East India Company). Both the Dutch and Company flags had a more permanent presence and are considered be the first South African flags, unlike the earlier colonial flags. There is a interesting version of the Vereentige Oostindische Compangnie flag in the Constantia Museum with a "C" above the monogram that is claimed to be the flag of the Vereenigde Oostindische Compagnie "Cape Chamber." However, since the only VOC flags which bore an initial over the monogram were those of the Chambers of the company, and there were just the six of them, this flag抯 origins remain questionable. The Cape was never a Chamber. It was under the management of the Middelburg Chamber. So, if any flag other than the VOC flag was ever flown in the Cape, it would have been that of Middelburg. For more information on this flag see Flags of the United Dutch East Indies Company. The French East Indian and West Indian Companies used Madagascar as their rendezvous for the trade with India, but a refreshment station was required in the south Atlantic. On 12 December 1666 a fleet of French ships arrived in Table Bay and on 18 December 1666 and later the French ship Saumacque carried out an inspection of Saldanha Bay and its environs. On coming ashore, a party erected a small wooden post, or marker, with an attached leaden plaque on which was engraved the coat of arms of King Louis XIV and with the inscription: Ludovico Decimo-quatro regnante, Franciscus Lopius Montevergius in Orienten Legatus posuit anno 1666 (in the reign of Louis XIV, Francis Lope Mondevergue, Viceroy in the East erected this in the year 1666). The French party departed in January 1667 without leaving a garrison, apparently of the view that the pole and plaque was enough proof of their claim. In 1670 another French expedition arrived at Saldanha Bay and a flag was hoisted on 30 September to a salute and cries of 揤ive le Roi de France� and the VOC soldiers in the area were captured. However, the French presence was temporary and the expedition had left by 12 October 1670 when messengers sent by the VOC arrived to protest their actions. While there is no description of the French flag used at Saldanha Bay, the royal arms on the plaque contained three fleurs-de-lis. On the royal standard these were yellow on a blue field. The French naval ensign at the time was white with several small golden fleurs-de-lis. Which of these flags was hoisted at Saldanha Bay is a matter of speculation, but it is thought that the naval ensign would have been the most likely given that the fleet was a naval expedition under naval command. The British occupied the Cape following the capitulation of Dutch troops on 17 September 1795 in order to prevent the French from taking control and the British Union Flag replaced the Dutch tricolor, which had flown over the Cape for almost a century and a half. The Union Flag at that time was that which had been adopted in 1606 and bore the crosses of St. George and St. Andrew to signify the union of the English and Scottish kingdoms in 1603. Following the Act of Union in 1801, Ireland united with England and Scotland and the cross of St. Patrick was added to the Union Flag to give it the design we know today. This flag was also flown in the Cape until the First British Occupation ended in 1803. After the British returned and seized the Cape of Good Hope area in 1806, many of the original Dutch settlers (the Boers) trekked north to found their own republics. In 1833 slavery was abolished throughout the British Empire, including at the Cape. The Dutch settlers were unhappy about this as they relied on slaves to work their farms. Furthermore, the colonial administration attempted to anglicize the settlers by banning the use of Dutch in the courts and at schools. The general feeling of dissatisfaction and insecurity resulted in the decision of many of the Dutch settlers to leave the Cape and migrate into the hinterland. This migration came to be called Die Groot Trek (The Great Trek) and the migrants became called the Voortrekkers (advance trekkers or pioneers). Between 1835 and 1845, some 10,000 Boer (Dutch farmer) families left the Cape Colony and trekked north into the interior of what is now South Africa. The Voortrekkers comprised independent groups of families and neighbors under prominent leaders. The Orange Free State and the South African Republic were not the only Boer republics to be set up during the Great Trek. A number of smaller transitory republics also came into being during the last quarter of the 19th century and each had a flag of its own. The First British Occupation of the Cape ended in 1803 with the Peace of Amiens in terms of which the Cape was returned to the Dutch. The Dutch East India Company had been liquidated in 1796 and the Dutch state, under the influence of the French, was now known as the Batavian Republic. The Constitution of 1798 made determined that the Batavian Republic would possess a centralized government patterned after that of the Directory in France and bound the newly formed Republic to France by alliance. Under Napoleon the system of government and the Batavian Republic was renamed the Batavian Commonwealth, and executive power put into the hands of a ruling council. In 1806, the Batavian Commonwealth was replaced by the Kingdom of Holland under Napoleon抯 brother Louis which lasted until 1810, when the northern Dutch provinces were incorporated into the French Empire. The flag of the new republic was the Dutch tricolor of red, white and blue with the Hollandsche Maagd (Dutch Maiden) added to the canton. The Dutch Maiden was a seated woman, facing a reclining lion, holding a shield and a staff crowned by the Cap of Liberty. The "Hollandsche Maagd" on a white field was also used as the Batavian Republic Naval Jack. At the Cape she became known as the Bataafsche Maagd (Batavian Maid) and later, the Lady of Good Hope, appearing in the crest of the Arms of the Cape Colony and in the shield of the South African coat of arms used between 1910 and 2000. The Batavian flag had a short history at the Cape, being replaced in 1806 when the Netherlands, then controlled by the French, declared war on the British and the British again occupied the Cape. The Second British Occupation lasted until 1815, when the new Dutch kingdom ceded the Cape permanently to Britain in a treaty following the Napoleonic Wars. Although a formal British colony since 1815, the Cape continued to fly an underfaced British Union Flag until the adoption of a distinctive colonial ensign in 1876. The first group of Voortrekkers under Hendrik Potgieter adopted a blue flag bearing a red saltire which became known as the Kruisvlag (Cross flag). Some historians have argued that this flag was based on the saltire of Burgundy. However, the Voortrekkers kept few written records and the circumstances which led to this design are clouded in obscurity. A party of Voortrekkers reached what is now KwaZulu-Natal and established a republic there which they named Natalia. Initially a Dutch tricolor was used, but a flag of Natalia was hoisted on 24 December 1839. This was based on the Dutch colours, with the central stripe becoming a triangle, extending from the centre of the hoist, to occupy the full length of the fly. This flag flew until 26 July 1843 when the British forced the Boers to withdraw and annexed the territory as the Colony of Natal. In the area between the Orange and Vaal Rivers the Voortrekkers established the Republiek den Oranje Vrijstaat (Republic of the Orange Free State). When the new state came into being on 23 February 1854 it possessed neither arms nor a flag and the flag of the Batavian Republic was initially used. On 15 May 1854 the Orange Free State (OFS) Government Secretary wrote to the Republic's Consul in the Netherlands and asked whether King William III would be willing to grant the OFS arms and a flag. This was followed by a personal letter to the King from President Hoffman on 15 October 1854. The request for arms and a flag was eventually granted and on 12 January 1856 the King's special envoy arrived in Bloemfontein (the capital) with the royal gifts and the flag was formally adopted on 28 February 1856. The flag consisted of seven equal alternating horizontal stripes of white and orange with the Dutch flag in the canton. Both the arms and flag remained in use until the OFS came to an end following the signing of the Treaty of Vereeniging marking the end of the Anglo-Boer South African War on 31 May 1902. The Republic of the Orange Free State then became the British controlled Orange River Colony. When the various Voortrekker parties crossed over the Vaal River they were divided into four independent minded entities of Potchefstroom, Lydenburg, Zoutpansberg and Utrecht. Except for the latter, each also had a different flag. Potchefstroom, under the leadership of Andries Pretorius, used the flag of Natalia. In the Zoutpansberg, under the leadership of the Hendrik Potgieter, the Kruisvlag (Cross flag) was used while in Lydenberg, under Frans Joubert, a Dutch tricolor with a light blue stripe at the bottom was used. Utrecht later united with Lydenberg, so it is presumed that it also used the Lydenberg flag. A flag for the Zuid-Afrikaansche Republiek (South African Republic) was adopted by the Volksraad (Parliament) on 18 February 1858. The flag was the Dutch tricolour with a green vertical stripe (for liberty and youth) at the hoist and become popularly known as the Vierkleur (four colour). Thomas Francois Burgers became President of the South African Republic in 1872 and was not in favour of the Vierkleur flag and wanted to restore the old Kruisvlag. In order to conform with heraldic rules, with which the President was acquainted, a white fimbriation was added to the red saltire. The new design was discussed by the Volksraad (Parliament) and the flag was adopted on 24 October 1874 as the new flag of the South African Republic. This decision immediately encountered widespread opposition, particularly in Potchefstroom where the Vierkleur had been designed and first hoisted. Opposition to the new flag continued grow until, during the absence of President Burgers on a trip to Europe, the Volksraad reversed its decision and reinstated the Vierkleur on 10 May 1875. The so-called "Burgers flag" was designated as the President's flag, to fly alongside the Vierkleur whenever the President was present. On his return, Burgers rejected the concept of a personal flag for the President and the flag was abolished. Stellaland arose from the internecine warfare amongst the Tswana clans on the western border of the South African Republic, which was then still largely undetermined. Civil war between the Koranna and Rolong tribes broke out in 1882 and Boer volunteers were invited by both sides to assist in the war. Their payment would be in the form of land. A peace treaty between the contending chiefs was concluded in 1882 which ceded a substantial portion of territory to the volunteers. They formed a Volksraad and established the Republic of Stellaland in July 1882 with Vryburg as its capital. There is some controversy as to the design of the flag. The name of the republic is said to be derived from Sterland (Dutch for Land of the Star) in memory of a comet which became known as the Great September Comet of 1882. The flag chosen also reflects this astronomical event. Initially a plain green flag defaced with the new republic´s coat of arms was used but this was changed in 1883 when the arms were replaced by a white star. The number of points on the star is open to debate as some vexillological sources claim it was a 5 pointed star and others say the star had six points! A further change saw the adoption of a flag divided vertically green and red with a white eight-pointed star placed in the centre. The Republic of Goshen was also located on the western border of the South African Republic and was also established when land was given to Boer volunteers by Chief Machette who had assisted him in a war against Chief Montsioa. The Land of Goshen (its name derived from the Old Testament) was established with Rooigrond as its capital. On 05 March 1883 Goshen adopted a flag based on the Vierkleur but with the horizontal stripes being black, white and red. These were the colours of the German Imperial flag at the time and it is not certain whether this was an influence in the choice of these particular colours or not. Like Stellaland, Goshen did not last long and also became a victim of British imperial ambitions in the region. It was incorporated into British Bechuanaland in September 1885 and was also later incorporated into the Cape Colony. The Anglo-Zulu War of 1879 resulted in the defeat of the Zulu nation and Zululand was divided into 13 chieftanships to remove the threat of the Zulu Kingdom to the fledgling Colony of Natal. The lack of a central authority soon involved these chieftanships in internecine strife which resulted in Boer volunteers being called into assist, in return for which over 800 farms were paid as a reward for the services they provided. On 16 August 1884 the Boers proclaimed a Nieuwe Republiek (New Republic) with Lucas Meyer as President and Vryheid as its capital. The constitution was modeled on that of the South African Republic, as was its flag, which was identical to the Vierkleur except the blue and green stripes were interchanged. A Volksraad resolution of 13 November 1884 specified that miniature flags were to be placed on each of the stripes; thus the British Union Flag was added to the blue stripe, the South African Republic (Transvaal) Vierkleur was added to the red stripe, the Orange Free State flag was added to the white stripe and the new Cape Colony blue ensign to the green stripe. There is no evidence that this version of the flag was ever flown but the simplified version was used as the flag of the Nieuwe Republiek. Although de facto recognition was given by the British, the annexation of Zululand resulted in the Nieuwe Republiek losing a large part of its territory. On 14 September 1887 it signed a "Treaty of Unification" with the South African Republic. On 21 July 1888, the Nieuwe Republiek ceased to exist when it was formally incorporated into the South African Republic. Initially after the British took control of the Cape in 1815, only the British Union Flag was used as the Cape had neither a badge or a coat of arms. The colony of the Cape of Good Hope was officially granted its coat of arms by Royal Warrant dated 29 May 1876. These arms were, however, in use earlier as they were incorporated into a defaced British blue ensign as the flag of the colony and hoisted for the first time in Cape Town on 12 May 1875. The full achievement of the arms was placed as a charge on a white disc in the fly of a British blue ensign. Although no warrant was issued for a red ensign version, a red ensign version was sometimes used, albeit unofficially. This flag was used until the Cape Colony became part of the Union of South Africa on 31 May 1910. Although occupied by the British in 1841, Natal was administered from Cape Town until 1856. The Legislative Council of Natal adopted both a red and blue ensign bearing its Colonial Seal on a white disc in fly in August 1870. The complicated nature of the seal did not lend itself to successful application on flags and a simplified version of the seal was adopted on 23 August 1875. This device formed the basis of the Colonial coat of arms which was granted by Royal Warrant on 16 May 1907. The simplified version of the blue ensign was used until Natal became part of the Union of South Africa on 31 May 1910. There does not seem to have been a simplified version of the red ensign. On 11 October 1899 war broke out between the Boer republics of the Orange Free State and the South African Republic (Transvaal) and Britain. Tensions had been simmering for years, but the influx of foreigners, many of them British, to the Witwatersrand following the discovery of gold and the resentment this created amongst the Boers, together with the fear that they would become outnumbered in their own country, precipitated what is now known as the Anglo-Boer South African War. The war lasted three years until the Treaty of Vereeniging was signed on 31 May 1902 under the terms of which the Boer republics became British colonies with responsible government. Eight years later on 31 May 1910, the four colonies amalgamated to form the Union of South Africa, a self-governing dominion within the British Empire. However, the flags adopted at the time of the Union were based on the British colonial pattern and were not popular, particularly with the Afrikaners (Boer descendants) after having suffered defeat in the Anglo-Boer South African War. Public opinion was such that by the mid-1920s discussions were underway to design a new flag. However, the issue was very politically sensitive given the lingering distrust between the English and Afrikaans speaking sections of the white population so it is no surprise that the final design for a new flag would be a compromise. The Orange River Colony came into being as a British Crown Colony when the Anglo-Boer South African War ended on 31 May 1902, and comprised the territory which had previously been the Republic of the Orange Free State. New arms for the colony were granted by Royal Warrant on 10 December 1904. The flag of the colony was a blue ensign with the principal charge from the arms, a Springbok antelope, being placed in a white disc in the fly. This flag was used until 31 May 1910 when the Orange River Colony became the Province of the Orange Free State within the Union of South Africa. The Transvaal Colony came into being as a British Crown Colony when the Anglo-Boer South African War ended on 31 May 1902, and comprised the territory which had previously been the Zuid-Afrikaansche Republiek (South African Republic). No coat of arms was granted to the Transvaal but King Edward VII granted it a Great Seal. Although the charge from the seal, a lion and two palm trees, was placed in the centre of a British Union Flag as the flag of the Governor, there is some doubt as to whether it was used as a badge on a blue ensign, although such a flag was illustrated in vexillological literature at the time. As the Transvaal has no coastline, the use palm trees in the badge appears to have been artistic licence. This flag would have been used until 31 May 1910 when the Transvaal Colony became the Transvaal became a province within the Union of South Africa. When the four British Colonies, namely the Cape of Good Hope, Natal, the Orange River Colony and the Transvaal were joined together on 31 May 1910 to form the Union of South Africa, this newly created dominion within the British Empire had neither its own coat of arms or any distinctive flags. The official national flag of the Union of South Africa was the British Union Flag from 31 May 1910 to 30 May 1928; and together with the South African national flag from 31 May 1928 to 05 April 1957. A coat-of-arms was later duly granted by Royal Warrant on 17 September 1910. Following the granting of the arms, Admiralty warrants were issued for both a red and a blue South African ensign on 28 December 1910, both of which contained the shield from the newly adopted arms in the fly. For practical reasons the original design of the South African red ensign was altered on 25 March 1912 by placing the shield on a white disc so that it would be more distinctive from the colour of the fly since the background to the first quarter was also red. Since the blue ensign was intended for use by Government vessels, and South Africa at that time possessed few such vessels, this flag was virtually unknown and ceased to be used on 31 May 1928 when a new South African national flag was adopted. The red ensign continued to be used after 31 May 1928 as the flag of the South African merchant navy until 1951. Examples with the full achievement of the arms on a white disc in the fly are also known to have been used. The new flag of South Africa was officially hoisted on 31 May 1928 and was based on Princevlag first brought to South Africa by Jan van Riebeeck in 1652. The flag comprised three horizontal stripes of orange, white and blue. In the centre on the white stripe were the British Union Flag (representing the Cape and Natal), the former flag of the Orange Free State hanging vertically and the former Transvaal Vierkleur. The three flags were arranged such that none had precedence over the other, hence the British Union Flag, which is nearest the hoist and thus in a superior position, is however spread horizontally from the centre of the flag towards the hoist (and is thus depicted in a reverse position). Although placed horizontally furthest from the hoist, to balance the Union Flag, the Vierkleur is the only one of the "flaglets" to be spread in the same direction as the main flag, which compensates for its otherwise less favorable position. The Orange Free State flag hangs vertically in the centre with the Dutch flag in the canton placed near the upper hoist of the main flag and so the Free State flag is also reversed. In terms of the Union Nationality and Flags Act of 1927, both the British Union Flag and the South African national flag were official flags of the Union. The dual flag arrangement ended in April 1957 in terms of the Flags Amendment Act which provided that the South African flag would henceforth be the only national flag. The rise of Afrikaner nationalism saw the election of the predominantly Afrikaner National Party to power in 1948. The National Party was determined to reverse the loss of Boer sovereignty under the provisions of the Treaty of Vereeniging and remove the British "connection." This was done by removing the British symbols of the anthem and flag in 1957 and finally winning a referendum in 1960 on the issue of whether the country should become a republic. The National Party also came to power on the premise of racial segregation and instituted the policy of apartheid (separateness). This policy was increasingly criticised internationally and led to the country´s diplomatic and economic isolation by the 1980s, as well as to increasing internal political unrest. Universal adult suffrage elections were held for the first time in South Africa on April 27, 1994, ushering in a new democratic political dispensation. To reflect these new political changes, a new flag was hoisted on April 27, 1994. One of the cornerstone aspects of the apartheid policy in South Africa was the establishment of the so-called "Homelands" (or Bantustans) for the Black population. These were areas originally set aside in terms of the Natives Land Act (1913) for the exclusive use of the Black population. Following the promulgation of the Promotion of Black Self-Government Act in 1959, the Black population was divided into ethnic groups and each group was linked to a specific "homeland" (i.e. Zululand for the Zulus, etc.). Each homeland became self-governing with its own legislature and all the trappings of statehood, including a flag. A dual flag policy was adopted whereby the homeland flags flew together with the former national flag of South Africa. Ten homelands were created, of which four later opted for "independence" from South Africa. The independent status of these homelands was not recognized internationally. The homelands ceased to exist and were re-incorporated into South Africa with the adoption of the new democratic constitution on April 27, 1994. After the referendum of 1960, South Africa withdrew from the Commonwealth and became a republic on May 31, 1961. Despite calls for a new flag, there was no change and the flag adopted in 1928 was retained, placing South Africa in the unique position of being a republic outside the Commonwealth whose national flag contained the British Union Flag. This flag continued to fly until April 26, 1994 when a new flag was adopted to reflect the change in the political dispensation in the country. Following the un-banning of previously restricted political parties and the release of all political prisoners, including Nelson Mandela, on February 2, 1990, negotiations to abolish apartheid and establish a fully democratic state began. This resulted in the adoption of a new Constitution and the holding of universal adult suffrage elections in April of 1994. Transkei was the first homeland to be created and was the first to adopt a flag. The Transkei flag was adopted on May 20, 1966 and was officially hoisted for the first time on (South African) Republic Day, May 31, 1966. The flag remained unchanged when Transkei was granted independence on October 26, 1976 and continued in use until the Republic of Transkei was reincorporated into South Africa on April 27, 1994. The flag was a simple horizontal tricolour of ochre over white over green. Ochre symbolized the soil of the territory signifying security and self-sufficiency. White stood for Christianity and peace and green represented vegetation. There were distinctive flags for the law enforcement and security forces in the Transkei and these included: flags for the Transkei Defence Force, Transkei Prisons Service, Transkei Army and the Transkei Police. The flags of the Transkei Defence Force (TDF) and the Transkei Prisons Service (TPS) follow the same design as that adopted for many flags of South African Homelands, namely having the national flag in the canton with a badge in the fly. However, the flag of the Transkei Army does not follow this general pattern, but has instead a green malachite field charged in the centre with a yellow bull抯 head, the emblem of the Transkei Army. A smaller version was also used as a car flag by the Commander of the Transkei Defence Force. The flag of the Transkei Police also has a somewhat unusual design. The flag consists of three equal horizontal stripes of blue white and blue, with the national flag of Transkei being placed in the centre of the white stripe. The badge of the Transkei Police is found in the canton. All these flags ceased to be used following the re-incorporation of Transkei into South Africa in 1994. The flag remained unchanged following the granting of independence on December 6, 1977 and was in use until April 26, 1994, following which Bophuthatswana was re-incorporated into South Africa. The Presidential standard of the President of Bophuthatswana has a dark blue field, in the centre of which is the national coat of arms of Bophuthatswana. This design is the same as that of the flag used by the President of South Africa between 1961 and 1983, which in turn is based on the design of the flag used by the Governor-General of South Africa between 1931 and 1961. There is some debate as to whether this flag was actually flown, although there is photographic evidence of it being used as a car flag. Following the re-incorporation of Bophuthatswana into South Africa in 1994, the post of President of Bophuthatswana was abolished and consequently this flag is no longer in use. There were distinctive flags for the law enforcement and security forces in Bophuthatswana and these included: flags for the Bophuthatswana Defence Force, Bophuthatswana Army, Bophuthatswana Police and for the Bophuthatswana Internal Intelligence Service. The flags of the Bophuthatswana Defence Force (BDF) and Bophuthatswana Army follow the same design, comprising three equal vertical stripes, the central stripe being a different colour from the outer two, with the badge of the BDF in the centre. The Police flag also has a badge in the centre of a 9 pointed star in the centre two horizontal stripes. The flag of the Internal Intelligence Service was registered by with the South African Bureau of Heraldry on April 19, 1985. The flag of the Bophuthatswana Prisons Service follows the same design as that of the Bophuthatswana Defence Force and consists of three equal vertical stripes of green, blue and green with the badge of the Bophuthatswana Prisons Service placed in the centre of the blue stripe. Bophuthatswana, which means a "gathering of the Tswana people," was officially the Republic of Bophuthatswana during the Homeland period, but in 1994 was reintegrated into South Africa, and its territory distributed among the new provinces of the Orange Free State, Northern Cape, and North West Province. These flags are no longer in use since 1994. In 1972 the Legislative Assembly of the Ciskei decided to adopt a flag for the territory. The initial design considered was a simple blue over white bicolour, but this was rejected as being too similar to an existing national flag (although not specified by name it is thought the reference was being made to the flag of San Marino whose flag is the inverse being white over blue). A second design considered was a sky blue flag divided by a white diagonal stripe in the centre of which was the Ciskei coat of arms. This design was also not considered appropriate as it was felt that the arms in the centre would be so small as to be unrecognizable. A modified design was finally adopted as the flag of the Ciskei on June 22, 1973 whereby a Blue Crane (Indwe) was placed in the centre of the white diagonal stripe. The flag remained unaltered following the granting of independence on December 4, 1981 and was in use until April 26, 1994, following which Ciskei was re-incorporated into South Africa. There were distinctive flags for the law enforcement and security forces in the Ciskei and these included: flags for the Ciskei Defence Force, Ciskei Police (and various sub-branches) and the Ciskei Prisons Service. The flag of the Ciskei Defence Force follows the general pattern used in southern Africa, having the national flag in the canton and the badge of the Force in the fly. This pattern was also adopted by the Ciskei Prisons Service. The flag of the Ciskei Police retains the national flag in the canton, but has the Police badge in the centre of a diagonal green stripe on a white field. The flag of the Ciskei Traffic Police Force has the Ciskei flag in the canton and the badge of the force in the centre of the flag. Venda was the last of the homelands to opt for independence. Its flag resembled the former Transvaal Vierkleur and was officially adopted on July 21, 1973. The brown on the Venda flag represented the fertility of the soil while the yellow symbolized the flowers of Venda. At the time of its adoption, Venda was the only country in the world to include brown as part of its national flag. Green represented the environment and fairness and also alludes to the ancestors of the Venda people. Blue represented the sky and the traditional head-dress (Vhulunghamadi). The letter "V" stands for Venda and the people, the Vhavenda. The flag continued in use unchanged following the granting of independence on September 13, 1979 and was in use until April 26, 1994, following which Venda was re-incorporated into South Africa. There were distinctive flags for the law enforcement and security forces in Venda and these included: flags for the Venda Defence Force, and the Venda Police. The flags of the Venda Defence Force (a small infantry formation and an air wing) and Venda Police were both based on the designs of their South African Counterparts. The flag of the Venda Defence Force has a red field with the Venda flag in the canton and emblem of the VDF in the lower fly. The Venda Police flag has a similar design but with a horizontal gold stripe in the centre and having a light blue field. Both the flags of the Venda Police and the Venda Defence Force ceased to be used following the re-incorporation of Venda into South Africa in 1994. Internal self-government was granted to Gazankulu on 01 February 1973 and it adopted a distinctive flag on December 18, 1973. 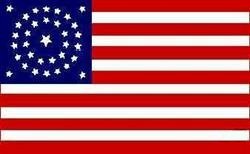 The flag consisted of three equal horizontal stripes of blue, white and blue. In the centre of the white stripe were two black spoons linked by a chain. The blue stripes symbolized the infinity of the sky, and like the sky, there should be no limit to national advancement and development. The choice of black and white in the central stripe alluded to the co-operation between the races in South Africa, the theme of co-operation and harmony being further emphasized by the traditional, interlinked spoons. The spoons are a traditional emblem of harmony, peace and hospitality. Gazankulu ceased to exist as a separate administrative entity on April 26, 1994 and now forms part of the Limpopo Province. KwaNdebele was granted internal self-government on 01 April 1981 and in 1982 indicated that it would move towards full "independence" from South Africa. However on August 12, 1986, after months of internal strife and unrest in the Homeland, it was announced that Legislative Assembly had rejected independence scheduled for December 11, 1986. The release from prison of Nelson Mandela and the un-banning of various political organizations by the South African government in February of 1990 resulted in the halt to any further political developments in KwaNdebele as South Africa, as a whole, moved towards full democracy. The flag of KwaNdebele was adopted on October 6, 1982 and was a horizontal tricolour of blue, yellow and green, with a traditional knobkerrie (spear-head) with four battle-axe heads in the centre. The blue in the flag was said to represent the colour of the sky and the endlessness of space, thus symbolizing the room needed by the Ndebele to fulfil their ideals. Yellow represented the light and energy of the sun and green stood for the colour of the plants and grass that is a source of food. It also symbolized growth and advancement. The knobkerrie is a symbol of authority vested in the government to maintain law and order, while the battle axes are symbolic of the struggle for self respect, self-determination and national pride. KwaNdebele ceased to exist as a separate administrative entity on April 26, 1994 and now forms part of Mpumalanga Province. The flag of the KwaNdebele Police has a green field with the KwaNdebele flag, fimbriated in white, in the canton, occupying one quarter of the length of the field, with the badge of the KwaNdebele Police being placed in the lower fly. Following the re-incorporation of KwaNdebele into South Africa in 1994, this flag is no longer used. The current South African national flag and South African Police Service flag now fly at all police stations in South Africa. KwaZulu was granted internal self-government on February 1, 1977 and adopted a flag in October of 1977. On the left of the flag was a vermilion coloured vertical panel one-third of the width of the flag in the middle of which was a white shield of a Zulu warrior. The remainder of the flag was white with three thin horizontal stripes of yellow, green and black in the center. A new flag was adopted in January of 1985 on which the order of the horizontal stripes was changed to black, green and gold and a full shield, staff and spears of a Zulu warrior were added onto the vermillion stripe. The Inkatha Freedom Party, which exercised political control in the KwaZulu Legislative Assembly, had its origins in the African National Congress (ANC). In the first KwaZulu flag the stripes in the middle of the flag were the reverse of those of the ANC. In the second flag, this was changed to the order found on the ANC flag, namely black, green and gold. These colours were said the represent the people (black), the land (green) and natural wealth and resources (gold). White and red are the additional colours of Inkatha. KwaZulu ceased to exist as a separate administrative entity on April 26, 1994 and now forms part of KwaZulu-Natal Province. The design of flag of the KwaZulu Police is based on that of the South African Police and consists of a light green field with a dark green horizontal band one-seventh of the width of the flag across the centre. The second version of the KwaZulu flag is in the canton and the badge of the Kwazulu Police appears in the lower fly. The flag of the KwaZulu Prisons Service (whose name was later changed to the KwaZulu Correctional Services) has a dark green field with the second KwaZulu flag in the canton, occupying one quarter the length of the field with the badge of the KwaZulu Prisons Service in gold, with black detail, in the lower fly. The KwaZulu Correctional Services badge consists of a gourd charged with a representation of the ground plan of a cattle kraal, with an inner kraal, above which are three Zulu huts; the gourd resting on a grass mat, all within and conjoined to two feathers tied together to form an open wreath. The flag was designed by the South African Bureau of Heraldry and the badge was registered under the Heraldry Act in 1991. Following the re-incorporation of KwaZulu into South Africa on April 27, 1994, the KwaZulu Police Force was amalgamated with the South African Police Service and this flag fell into abeyance. Lebowa was granted internal self-government on October 2, 1972 and adopted a flag on July 5, 1974. It was an unequal tricolour of light blue, white and green. In the centre was a gold rising sun with spreading rays. The blue stripe on the Lebowa flag alludes to the infinite sky and the need for development and progress. The green represents the land and the importance of agriculture to the lives of the Sotho people while the sunburst, radiating in all directions, symbolizes the dawning of a new day and the source of energy for development. Lebowa ceased to exist as a separate administrative entity on April 26, 1994 and now forms part of Limpopo Province. The flag of the Lebowa Police Force was designed by the South African Bureau of Heraldry and approved by the Lebowa Commissioner of Police in 1991. When Lebowa was reincorporated into South Africa in 1994 and the Lebowa Police were amalgamated with the South African Police Service, this flag was no longer used. The flag of the Lebowa Police comprised of a green field with the national flag of Lebowa in the canton, fimbraited in white, and occupying one quarter the length of the field. In the lower fly was the badge of the Lebowa Police. The badge comprises a fourteen-pointed facetted star in gold bearing in the centre on a white roundel the Arms of Lebowa in full colour, within a gold annulet bearing in black letters the words "LEBOWA" below and "POLISIE, MAPHODISA and POLICE" clockwise in a semi-circle above. QwaQwa was granted internal self-government on 01 November 1974 and adopted a flag on July 18, 1975. The flag was green with a central orange horizontal stripe in the centre, separated in the centre by a black Basotho pony. The green symbolized the land, while the two orange stripes, coming from the hoist and fly respectively, represented the two original tribes from which the nation evolved and their traditional links with the Orange Free State. The Basotho pony refers to the sure-footed progress of the people on the often difficult path of progress. The Basotho pony is the natural means transport in this mountainous region. QwaQwa was re-incorporated into South Africa on April 26, 1994 and is now part of the Free State province. Since that date, the flag has not been used. KaNgwane was granted internal self-government on August 31, 1984. Unlike the other homelands, KaNgwane did not adopt a distinctive flag of its own and only flew the former national flag of the Republic of South Africa. KaNgwane ceased to exist as a separate administrative entity on April 26, 1994 and now forms part of Mpumalanga Province. Like its predecessor, the design of the new flag is a compromise. At the time of its adoption, it was the only national flag in the world to contain six colours as part of its primary design. While the colours flag do not have any symbolic meaning in themselves, they do represent a synopsis of the country´s flag history. The design in turn, represents a converging of paths, the merging of both the past and the present. Black, gold and green, which were first incorporated into South African national flags in the 19th century, also feature prominently in the flags of the liberation movements, particularly the African National Congress (ANC), the Pan-African Congress (PAC) and Inkatha. These colours can thus be said to broadly represent the country's black population. Blue, white, red and green reflect the British and Dutch (later Boer) influence, as shown in the earliest flags flown in South Africa, and also featured prominently in the previous South African national flag (1928-1994) and thus represent the white population of South Africa. The green pall (the Y-shape) is commonly interpreted to mean the unification of the various ethnic groups and the moving forward into a new united South Africa. Although initially adopted as an "interim" flag, the Constitutional Assembly responsible for writing the new constitution also had to give consideration as to whether it should become permanent. The new flag design was so popular that it was written unchanged into the new South African constitution adopted in 1996.